Clinton won the recorded vote by 2.8 million. But the recorded vote is never equal to the True Vote due to election fraud. There is evidence that millions of illegals probably voted in 2016. 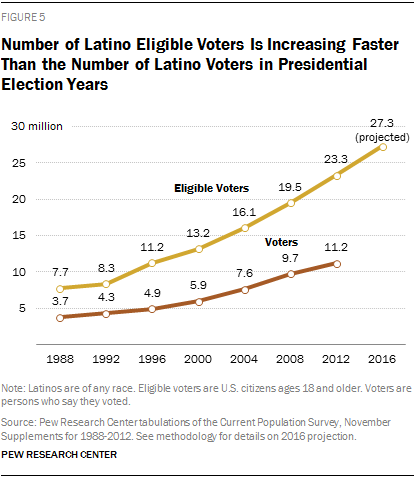 View this 1988-2016 trend analysis of Hispanic voter registration and turnout. According to Greg Palast, least one million Democratic minority voters were disenfranchised via Crosscheck which eliminated voters with duplicate names from voter rolls. He claims that 7 million minority voters were disenfranchised. There is evidence that George Soros , a Clinton backer, controls voting machines in 16 states. Election analyst Bev Harris has posted Fraction Magic , an algorithm used to flip votes on Central tabulators. Sensitivity analysis shows the effects of a range of assumptions on the vote count. Vote Flip- 5 million (net): 8% of Trump’s votes flipped to Clinton on voting machines and central tabulators.